ib.adnxs.com is the PUP that uses misleading techniques to prevent removal. Use Reimage to locate malicious components and get rid of them faster than with uninstall instructions. A full system scan blocks virus reappearance and prevents traffic to malicious domains. Ib.adnxs.com is a suspicious domain used for browser redirects to various websites. These sudden redirects are triggered by adware which can sneak into the computer in the software bundle. After the hijack, it immediately alters browser’s settings and Windows registry to cause browsing-related problems to the users. The simple explanation of what is adnxs – it’s a potentially unwanted program (PUP) which is used for shady advertising. 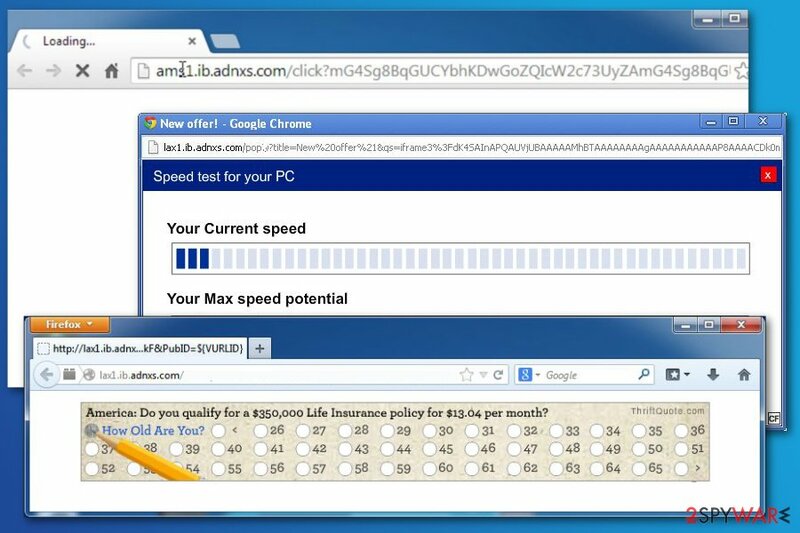 On the affected machine, adware might display misleading pop-ups, banners, ads, in-text ads and similar commercial content which diminishes browsing experience. The main purpose of the Ib.adnxs.com redirect virus is to drive traffic to specific websites. Website owners might want to increase their sales, promote products or services, or install malware or spyware on your computer. As you can see, Ib.adnxs.com popup removal is needed not only to avoid annoying activities when browsing the web but for protecting your computer and privacy. The ad-supported application might force you to visit high-risk websites or display malicious ads. PUPs are often exploited by crooks and cyber criminals. Hence, adnxs might not be an exception. Adware might promote bogus browser extension, optimization or security tools or urge to install available software updates. Installation of these entries might lead to infiltration of malware. Therefore, you should stay away from Ib.adnxs ads or pop-ups. However, avoiding them might not be that simple. Adware is capable of collecting non-personally identifiable and browsing-related information which is used for displaying targeted ads. Aggregated information about your visited websites or search queries is usually used for building user profile needed for advertising. In this way, adware can generate ads based on your interests and preferences. For this reason, you might be willing to click ads and let developers generate pay-per-click revenue. Now when you know what is what is adnxs.com and why it interferes your browsing sessions, you should know that adware’s activities should not be tolerated. Therefore, you should obtain a reputable anti-malware (e.g. Reimage, Malwarebytes MalwarebytesCombo Cleaner) and scan the system with an updated tool. However, if you do not want to use additional software to remove ib.adnxs.com, you can check our prepared manual removal guidelines at the end of the article. Redirects to Ib.adnxs.com and similar domains is the main sign of the adware hijack. The program, which is responsible for delivering ib.adnxs.com ads, travel bundled with various freeware or shareware. Users, who do not pay attention to the installation procedure, often install PUPs without realizing it. To avoid accidental installation of unwanted apps, you should start paying more attention to programs' descriptions. Also, make sure you select Custom or Advanced installation of the freeware to get an ability to opt out of suspicious additions. To remove ib.adnxs.com and its ads, you should scan your PC with updated anti-spyware and remove malicious entries from the system. Of course, you can also select manual removal of this PUP, but in this case, you will need to find all related programs, browser extensions and files yourself. Otherwise, this program may reappear on your computer. If you are willing to opt for automatic ib.adnxs.com removal, you should follow our prepared guide at the end of the article. Please, be very careful and attentive to avoid the elimination of important applications. Here, look for ib.adnxs.com or any other recently installed suspicious programs. Wait until you see Applications folder and look for ib.adnxs.com or any other suspicious programs on it. Now right click on every of such entries and select Move to Trash. When in the new window, check Delete personal settings and select Reset again to complete ib.adnxs.com removal. Once these steps are finished, ib.adnxs.com should be removed from your Microsoft Edge browser. Here, select ib.adnxs.com and other questionable plugins. Click Remove to delete these entries. Now you will see Reset Firefox to its default state message with Reset Firefox button. Click this button for several times and complete ib.adnxs.com removal. Here, select ib.adnxs.com and other malicious plugins and select trash icon to delete these entries. Click Reset to confirm this action and complete ib.adnxs.com removal. Here, select Extensions and look for ib.adnxs.com or other suspicious entries. Click on the Uninstall button to get rid each of them. Now you will see a detailed dialog window filled with reset options. All of those options are usually checked, but you can specify which of them you want to reset. Click the Reset button to complete ib.adnxs.com removal process. ^ Adware. Techopedia. Defining the latest tech buzzword . ^ What is a…PUP (Potentially Unwanted Program)?. FraudWatch International. Online brand protection . ^ Aatif Sulleyman. Malicious Youtube Ads Secretly Slowed Down Computers And Earned Bitcoin Alternative Monero For Attackers. The Independent. UK and worldwide news. ^ Viruset. Viruset. Norwegian cyber security news. This entry was posted on 2019-04-01 at 00:50 and is filed under Adware, Viruses. You can quickly scan the QR code with your mobile device and have ib.adnxs.com manual removal instructions right in your pocket. How did you remove ib.adnxs.com?